My latest job has proven very dramatic. The scenario: I recently joined a large software company in late august. I was hired by the GM, whom I met through a mutual acquaintance. Here’s where it gets complex. Apparently, the former GM had left in march, and the period between April and July saw the firm being run by the senior managers (3 of them). They were each vying for the GM position, and apparently were severely disappointed when this new GM was brought in. Since then, they have been trying all sorts of means to sabotage the new GM. They have depressed sales severely (10% decrease year-on-year), demoralized staff to the extent that the corporate sales force is experiencing a mini exodus every month (35 staff have left in 3 months) and spread all sorts of rumors. It’s been a war. Having been brought in by the new GM, I was immediately a target. One of the first tasks I was asked to do was to reverse engineer a piece of software that the senior managers had told him was impossible to do (blatant lies, nothing complicated). Even before I started on my work, a few of them tried to psyche me out of it. Now that it’s completed, I feel like I’m going to war every morning. Not having enough rank to protect me, I’m the target of both direct attacks and backstabbing. From rumors, to sneers, to blatant sarcasm, to the managers turning their departments against me, it’s making my life very difficult. One of them even “lost” my reports and told the Managing Director that I hadn’t turned them in. What should I do? It’s getting ridiculous. Word got out that I was directly hired by the GM, and I’m getting flamed from every direction every day…. 1. You need to analyze the power structure. Who is above your GM that can help you? Who have you directly benefited in the company by achieving this software fix? You need to bring evidence to them and get them on your side. 2. What are the 3 main goals in your company? Does your work help the company to achieve those goals? 3. Can you speak to your GM and strategize a plan to prove your depts. value to the company? You also need to understand and appreciate the varying agendas in the company to plan your defense. Try to put emotion aside and think logically about your next steps. Thanks for your reply. I’ve never been in a situation as politically unstable as this, so it’s been… interesting. The Managing Director is above the GM. The software benefited the GM, and he’s already on my side. He’s fighting in this war too, so he’s pretty busy trying to keep the ship from sinking everyday. I’m not sure who’s side the MD is on… the new GM was brought in by the head office so in all honesty I’m not even sure if the MD wanted him as the replacement. So far the MD hasn’t done a thing to quell the unrest. In terms of company vision / mission statement I’m not too sure… I just help them broker deals and do subsequent project management work. The value’s already proven, the senior managers actually report directly to him. and I report directly to one of the senior managers. The problem is that there isn’t any evidence to gather. Except… I have evidence that my computer has a ton of spyware that shouldn’t be there. And it seems that one of my colleagues has been leaking information from my computer to the senior managers. Proving that he’s the source of the leak is impossible though. You’ve painted quite a picture of intrigue, division, deceit and backstabbing. Let’s try to step back and strategize an action plan. 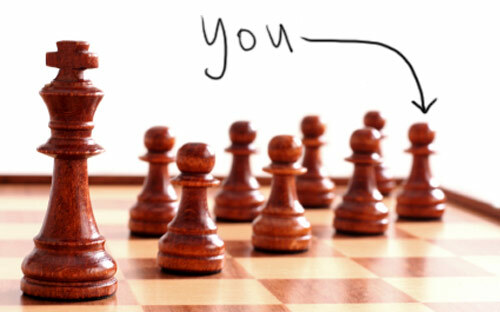 Being a pawn may not sound like a good thing, but it can help you to understand your place in the battle. If you were playing a game of chess, would you have very high expectations of a lowly pawn to defend the King or the Queen? No. So, relax. You are a pawn and as such you do not have the power to correct all of the GM’s problems. One thing that’s good about being a pawn is that expectations are low. No one is expecting you to save the company. This can work to your advantage. You are under the radar and may hear information which will help the GM win. You should also try to find out more about the Managing Director’s agenda. That is key to knowing whether the GM has a future at your company — and you. 5. What’s on the Horizon? It sounds like almost everyone in your company is mired in internal politics rather than external opportunities. They are so busy fighting internal wars that they are forgetting about the company’s goals. That leaves an opportunity for you…. Try to spot an opportunity that can help the company. What are your competitors doing right? Or wrong? What are the big trends in your industry that your company could profit from? Wouldn’t it be great if you could raise everybody’s sights a lot higher – to the opportunity that’s ready to be grabbed – if only you could work together? There is a terrific book by Dr. Edward de Bono called Six Thinking Hats. It outlines a disciplined methodology for getting people to all think in the same direction at once and align their visions. You may not be in a position to influence the company’s vision, however… knowing de Bono’s techniques will only help you in your career! So maybe you read that advice above and thought, “What’s in it for me? Why should I even try to shift the GM’s vision? I’m just a lowly pawn, remember?” You have a point. Your GM may ignore or dismiss you. But the process of raising your sights to spot external opportunities could help you to find a better job, with a corporate culture that is focused on winning against the competition – not killing each other. I hope this helps. Thanks for writing to Office-Politics. I’ve been applying to other positions these last couple of weeks. It does look rather odd on my CV that I’ve only been in this job 9 weeks and am already looking to leave. What you raised about looking for opportunities that can help the company… doubt anything short of miraculous will be paid any attention now. I agree, that if I somehow survive the war, there might be positions to fill, but it’s looking very sketchy right now. The GM’s up for confirmation in January, and so far he hasn’t been able to stop the slump or find substantial justification to replace the wannabe usurpers yet. It’s not very nice being a pawn! Thanks, I really appreciate your time and advice. It’s put things into context somewhat. Will keep you updated.